Mini bottles of Sauternes. My new favourite thing! We all know it’s popular to buy Sauternes in half-bottles, but what about an even smaller format with a handy screw cap? That’s what I have here – four of them. 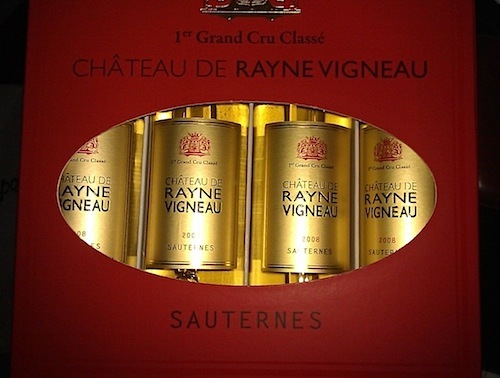 The bottles, from Sauternes estate Chateau de Rayne Vigneau, hold 250 ml of the sticky stuff and, thanks to the screw cap, make it easy to take on a picnic where you might not want to drink it all at once. Normally I’d say 250 ml would be the perfect amount for one person to drink, but because this is a sweet wine I think they are on the slightly large side. Perfect, then, to share with someone else. Sadly, I doubt these bottles are on general sale to the public. Can you imagine a top-end Sauternes estate selling in such a format under screw cap of all things? Sacre blue! Sounds cool, a nice gift. Gonna need to put in a few extra miles to work off the sweet stuff though!